There are many things to say today. But, I want to start with the simplest, and hardest, message of all. Which is, that we failed. We failed Rwanda. We failed to keep our promises. And, simply, we failed to do our jobs. The United Nations cannot run from this. We must face it – head-on. And, all of us must recommit to never let it happen again. Which is what we are here, to do, today. I want to thank the Permanent Mission of Rwanda, and the United Nations Department of Public Information, for organising this commemoration. And, in particular, I want to welcome Ms. Nishimwe, to the United Nations. She is here to share her story. I cannot imagine the courage it takes to do that. And, I am sure everyone in this room feels the gratitude that I do, towards her. As we begin today’s event, I want to make three brief points. The first is a reminder that people should come first. Not procedures. Not bureaucracy. Not politics. But people. Many years ago, I read about the Nyarubuye massacre. As news of genocide spread to this town, people fled to the church in desperation. They believed it would give them the best chance of survival. But they were wrong. Thousands of people died in that church, and the surrounding buildings. Many of them were killed in their tracks, trying to escape. Others died trying to protect their loved ones. People spent hours – if not days – hiding, hoping, praying and waiting. And, we were not there, to help them. Because, frankly, we were not focusing on them. Instead, we were debating over definitions. We were talking about what we should do – rather than doing it. We were letting our individual positions stop us from making joint decisions. And, we were not putting people first. That is why we failed. That is why thousands of terrified people prayed – for help that never came. And that is why we are here, to remember one of the darkest days in our history – and promise that it will never happen again. Here, I will turn to my second point, on prevention. Because, not only do we need to focus more on people – we also need to ensure that we prevent their suffering. This means stronger early warning systems. 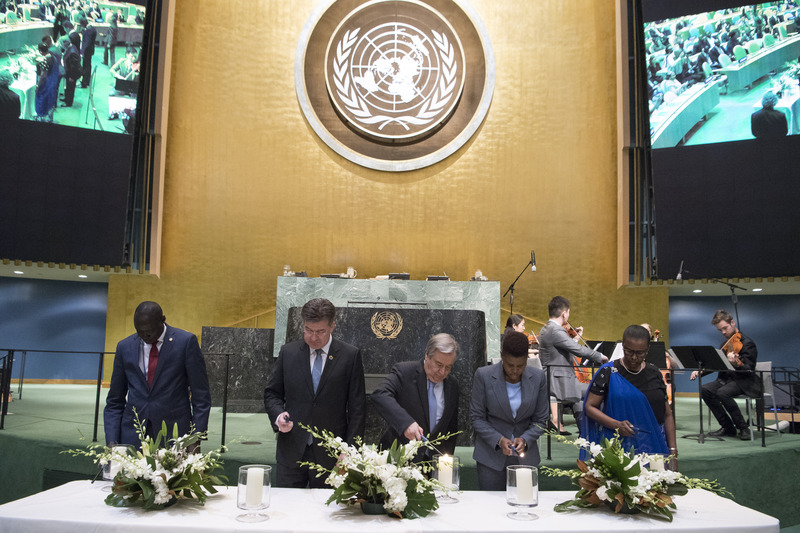 It means better mechanisms to flag – and respond to – early indicators of genocide, including human rights violations. And it means jumping into action – much sooner, and much faster, than we have in the past. I am not talking about things to do in the distant future. We must take action now. Warning signs are already flashing. Tremors are already being felt, in the ground. All around the world, we are seeing examples of intolerance, discrimination and hatred. And we simply cannot accept this. Today’s commemoration should remind us of what can happen, if we do not resist these trends. In Rwanda, hate speech played a role in one of the worst tragedies our world has ever seen. That is why, today, we need to remind ourselves of how high the stakes are. The final message I want to deliver is one of hope. Yes, we are here today to commemorate – and to mourn. But we must also take a moment, to be inspired. Horror is part of Rwanda’s past. However, its present is one of resilience, and strength. 24 years have passed. And, Rwanda continues to build itself back up. The reconciliation process has been crucial. Also, the role played by women cannot be overlooked. Rwanda now has one of the highest numbers of women parliamentarians in the world. And, the country continues to remind, educate, and inspire us all. We failed Rwanda. We failed to keep our promises. […]The United Nations cannot run from this. We must face it – head-on. To conclude, I want to say this one more time: we failed. We cannot fail again. We know this. We have made this promise before. But we need to make it, again. Not just at today’s commemorative event. But throughout everything we do, here, at the United Nations.